I’ve mentioned in a video or three that I’ve posted lately, that it gets a bit rainy around here this time of year. Just a touch. Average, annual precipitation in the Olympic or Cascade mountain areas, ranges from about 60-180 inches. It’s not usually torrential, and a lot of that in the upper elevations is of course in the form of snow… but much of the year, in the lower elevations, you’re just plain going to run in to some rain. 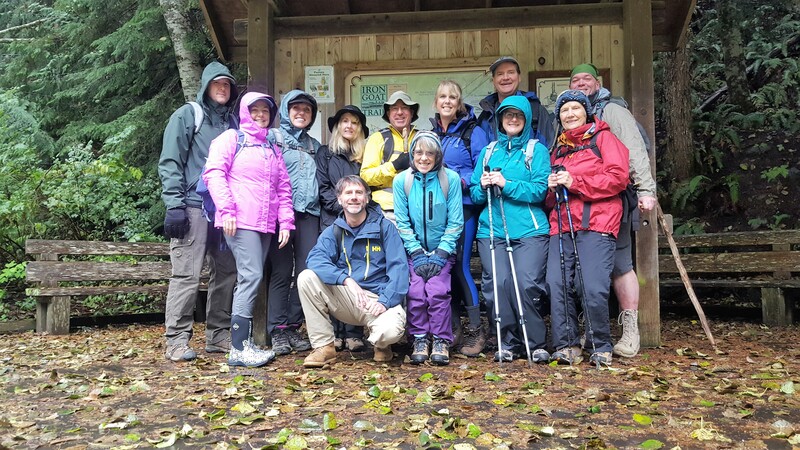 I’m not about to let a bit of rain keep me from getting outside… but if you’re not prepared… getting wet can make the difference between enjoying your hike and not. There’s a lot of options, and some will keep you more protected than others. Then there’s “breathability” and all that.. the point of keeping you from soaking in your own sweat inside the rain gear. But I’m not going to really get in to all that. There are so many aspects to picking this sort of gear, and honestly… not sure I’m qualified. For a lot of trips, a basic shell can be fine, light mists and such. The one I’m wearing in the above photo is one I usually keep handy in spring/fall for light rains. But light weight jackets like that are “water resistant” and eventually they basically get overwhelmed and start soaking up water instead of repelling it. On that particular October day, it was a light rain for most of the hike, but it started getting worse just over halfway thru the hike.. and eventually I could feel the water soaking thru. I pulled that jacket off and have a poncho I threw on. While heavier/thicker than the jacket, it soon started soaking through as well. And since it’s just a standard, square poncho, it doesn’t cover much beyond the bottom of my pack, so my rear was quickly getting wet. I am looking into getting a backpacking poncho, but that’s a whole ‘nother topic. I have a heavier Columbia jacket that I’ve had for years, it’s 100% nylon shell, treated with waterproofing. It takes a bit more to start soaking through, and I’m going to be re-treating it with some Nikwax (hopefully before this coming weekend). One thing I splurged on this year was some rain pants. I was getting tired of my upper body staying dry while my shorts were getting wet. Plus, with winter snowshoe season coming up, I wanted something I could throw on over my base layer and hiking pants that would keep my dry while parking it on a snowbank for lunch or whatever, even if it wasn’t actively raining or snowing. The first ones I tried were the Marmot PreCip Men’s Lightweight Waterproof Full-Zip Pant . That link takes you to Amazon to check out reviews and such, I really wanted a pair of full-zip pants for a few reasons. Make them easy to get on and off, zip down from the top for ventilation and getting at my other pockets. So these seemed great. I really liked them… I got through a long hike through the Ape Caves down near Mount St Helen’s and stayed dry, even after kneeling in puddles while crawling over rocks and such. 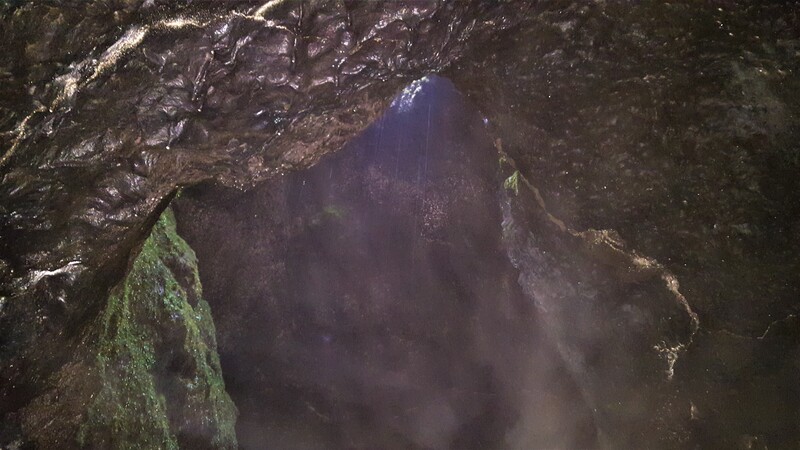 And I swear, it was raining more INSIDE the cave than it was outside. 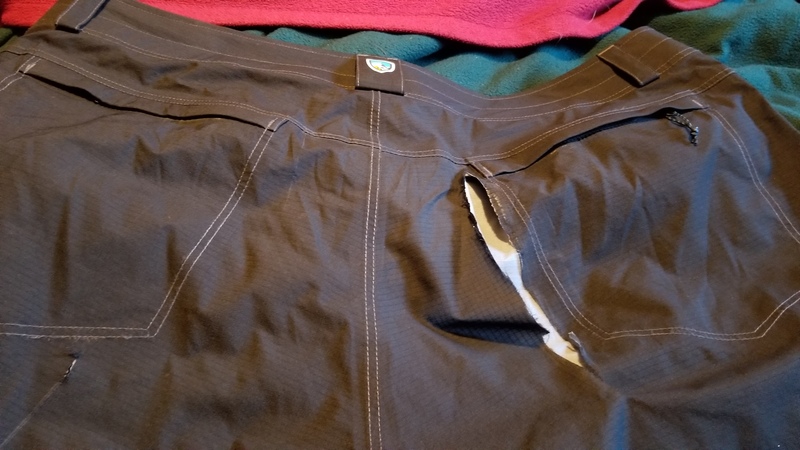 BUT… one problem I found is that I’m right between their L and XL in the waist sizing, and being that they have full zips, there was no way to cinch them tighter. Belt loops would have been nice to have, or a drawstring on the front half like I’ve seen on others… but no. And so while the L were too snug, the XL wouldn’t stay up. I was tempted to go pick up a cheap pair of clip-on suspenders… but in the end I took them back. I.. have no idea when, let alone how this happened. Not only is there a full split behind the right pocket, but also a small cut under the left. No clue. Now, I love REI. Yes, they can be a bit more expensive than some other places, but once you’re a member, their return policy is like having gear insurance. There are some.. maybe even a number of things I will look for better deals, but when it comes to boots, packs, and things like a $175 pair of rain pants… I’ll pay the REI premium because like those PreCip pants I first bought, if I’m not 100% satisfied, I have a year to take it back. Unfortunately… “REI’s guarantee doesn’t cover ordinary wear and tear or damage caused by improper use or accidents.” But, I thought, what did I have to lose, so I took them to the store to ask.. and because that cut on the left looks like some sort of cut.. it was pretty obvious this likely wasn’t some sort of failure of the pants and there just wasn’t anything they could do for me. While there, I found a pair of Mammut Gortex pants with 3/4 leg zipper that were vary nice… and only about $5 more than the original, full-price of these Kuhl’s. The material was thicker.. so maybe more durable…? but $180 is just not in the budget at the moment. I ended up with a pair REI’s Talusphere Pants, they’ve gotten a mix of reviews. But the material seems more like something that will stretch and flex and breath.. I may get a chance to take them for a test run on Saturday when I hike near the Carbon River. And if I don’t like them… well, that’s why I buy stuff like that at REI. I guess we’ll see what happens, maybe stay tuned to find out more. I’ve reached out to Kuhl on Twitter to see if they have any suggestions to do some sort of patch on these pants. I figure if nothing else I can patch them and keep them in my Jeep as a backup pair. If I hear from them, I’ll probably post something about it, cause others may find themselves in a similar situation and be looking for options. There was no real specific purpose for this post, other than to vent about ruining a nearly brand new piece of expensive gear. But maybe I’ll come up with some useful tips out of it in the end. If so, I’ll update or add a new post!